The first manufactured coins seem to have taken place around the Aegean sea between 700 and 500 BC. These Aegean coins were stamped (heated and hammered with insignia) The first ruler in the Mediterranean known to have officially set standards of weight and money was Pheidon. Minting occurred in the latter parts of the 7th century amongst the cities of Grecian Asia Minor, spreading to Aegean parts of the Greek islands and the south of Italy by 500 BC. Other coins made of Electrum (a naturally occurring alloy of silver and gold) were manufactured on a larger scale about 650 BC in Lydia (on the coast of what is now Turkey). 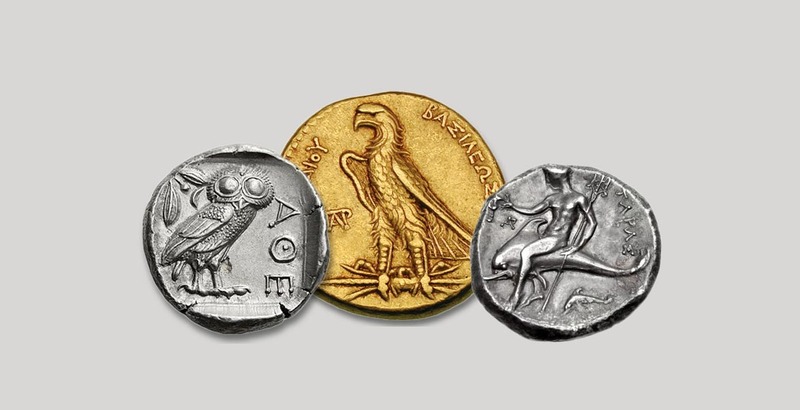 Similar coinage was adopted and manufactured to their own standards in nearby cities of Ionia, including Mytiline and Phokaia (using coins of Electrum) and Aegina (using silver) during the 6th century BC. and soon became adopted in mainland Greece itself, and the Persian Empire (after it incorporated Lydia in 547 BC). The use spread throughout the Mediterranean World eventually covering all the known world. Sarasota Numismatics is proud to offer a wide selection of NGC Graded Ancients Coins from Greece, Egypt, Roman, Byzantine, Judea, Persia, and others. These amazing coins allow us to not only enjoy the skill and art of ancient minters, but to take a trip back in time. You can literally hold history in your hand and wonder at the stories that coin could tell. To see our full inventory please visit here.